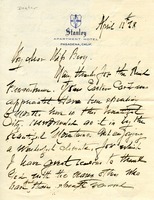 Note sent to "Miss Berry" thanking her for the inclusion of the author in the wedding of Hattie and Glenn, as well as apologizing for being unable to make a home visit to Miss Berry. Informs Martha Berry about Louise Moffett who knows about the family history. This is a letter to Tate Springs Development from Martha Berry asking for a carboy of Tate Water. 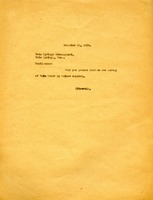 handwritten, Tate Springs, Tate Springs Development Co.
A praiseful letter to Martha Berry with an enclosed $5 for the Martha Berry School.